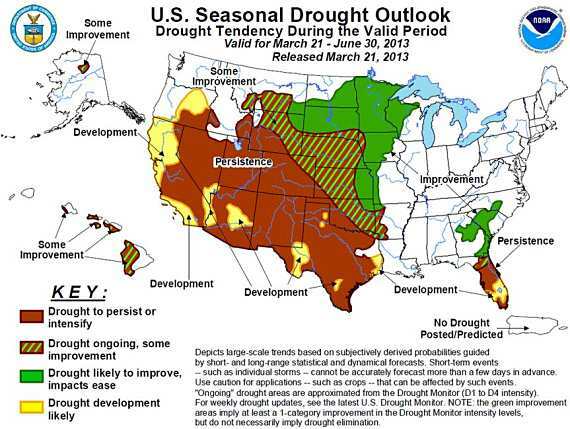 The National Weather Service has released an updated Seasonal Drought Outlook for March 21 through June 30, 2013. Latest Seasonal Assessment – The drought outlook for March 21 – June 30, 2013 is based primarily on short-, medium-, and long-range forecasts, initial conditions, and climatology. Since the release of the previous drought outlook issued on March 7, 2013, the largest drought improvement occurred across the middle to upper Mississippi Valley and the Ozark region. Improvement is forecast to continue across these areas and extend northwest to include much of the Dakotas and Minnesota. Some improvement is forecast for the most intense drought areas of the central and southern Great Plains. Prospects for drought improvement decrease further south across the southern high Plains and Texas. Drought is forecast to persist for much of the West and expand across northern California and southern Oregon. During the past two months, major improvement occurred across Georgia and South Carolina where additional improvement is expected. Drought is forecast to persist or develop across the Florida peninsula but it will likely be short-lived as the rainy season typically begins during June. Some improvement is expected for the smaller areas of drought across northern Alaska and the Hawaiian Islands.